You have got the best microphone for recording, but you are still searching for its partner, ‘microphone preamp’ that could pop up its performance. A microphone preamp is the finest way to achieving the premium quality recordings your mic can deliver. If are using voiceover mics to record your vocals in a live, a good preamp is essential. If you are into gaming, then your gaming mics won't necessarily need a preamp. But for recording, preamps are the great tools to use with mics. Earlier, microphones used just to provide additional power to help it work better, but nowadays these robust amps can do wonders for your ongoing setup regarding upgrading the functionality, enhancing the recording quality, and standing out from others. In this post, we will tell you about top 10 best microphone preamps that can do wonders to your performance, but before that check this buying guide that can help you select the best mic preamp. Factors to look for while buying the best microphone preamp! Before you go on straight to the reviews of 10 best microphone preamplifiers, there are some buying guidelines that you must look into first. These factors would give you insights into the preamp buying process before you finalize one. While considering these factors, just also remember that your preamp is an important link in the chain that can make a great impact on your final performance. Money is always a top priority, and it ranks number one even when you are looking for the best mirophone preamp. With a plethora of options available in the market, the total sum of money you wish to spend would keep you focused in one direction. There are few preamps within the range of $100, while there are others who are double or triple to this cost. So, you have to decide on how much money you seriously want to spend. Once you have decided on a budget limit the next vital aspect to look for is the number of channels. Microphone preamps come with one channel, which may extend to 2, 4, 8 and even more numbers of channels. Every mic needs its own specific channel, so, depending on the mics you wish to link to the preamp you can decide for the numbers of channels. If a multi-channel preamp is costing you more, then you can go for a 2 or 4 channel preamp as in that case you can record different instruments individually and not simultaneously. These preamps can be used in home studio recordings. ​The best microphone preamp models come in either a solid, tube or hybrid type. The type you select largely affects the overall sound quality. Tubes are considered harmonious, while solid-state preamps deliver digital sound, which is much clearer and crisp. If you opt for a Hybrid type, then you can avail the features of both tube and solid preamps. So, make a clever selection! The inputs and outputs in a microphone preamp are related to terms of count and the variations in these two. Every preamp consists of at least one input and one line-level output. It is sufficient, but if you wish to get more volume of the job done, then you can look for a hi-Z Direct Input (DI) to record bass, guitar and other electrical instruments. There are some options available with a single output. An XLR output and a combination of ¼” TRS output, for instance, can offer you with more connectivity options. Preamps with numerous outputs will allow you to employ the preamp as a signal splitter. Also, there are preamps with an inbuilt A/D converter that enables you to run a digital signal directly to your recording device. It also produces less noise floor as compared to the analog connection. ​There are three basic packages for mic preamps – standard 19” rack mount, desktop unit, or a 500 series module. Some brands even offer units in multiple form factors, such as 500 Series and more. So, you can select a mic preamp that suits your set up and aids your creativity and workflow. Besides the above-mentioned factors, the other additional features that you can have a quick glance at are VU meters, ADAT output, huge impedance ranges, rack-mount compatibility, hi-Z switches, high and low pass filters, M/S matrix, and more. Top 10 best microphone preamps that you must try! The m101 preamp from Grace Design is a singular channel microphone that uses fast, musical trans-impedance amplifier architecture like the model 201 and model 801, but the pricing and packaging differ and within reach of any recording expert. It is a fully-balanced, convertible circuit topology that lacks electrolytic capacitors in the signal path. With spectacular bandwidth, resolution, and headroom, the device is natural, detailed and musical. Also, It possesses a ribbon microphone mode that offers additional input gain. While the phantom power prevents the occurrence of any damage to ribbon microphones, the microphone input impedance increases from 8.1 kHz to 20 kHz. This preamp is simply awesome. It is a good value and comes with a ribbon button that makes it pretty much easy to use. It is an upgraded version of the old model and hence lacks a wall wart and an unbalanced out. So, if you are looking for an effective device for clean and low-noise sound, then you are at the right place. Everything is perfect, and there is no noise even when you place the space heaters nearby. The nice rock solid built is very much appealing. It lacks rack mountable aspect that can create some difficulty in introducing it in your setup. The ART TubeOpto8 is an 8-channel output, and input expander for any ADAT-equipped interface, DAW or hard disk recorder. It is a cost-effective device that comes with eight high-quality channels. The second-generation, Class A and discrete microphone preamp are packaged in a singular rack space with 24-bit digital I/O. You can avail complete control of the signal path with the use of every input. You can also regulate the phase, frequency levels with roll-off switches. The variable output level and input gain control for each channel enable up to 70db of clean gain with fantastic sonic transparency. Each channel on the device possesses wide-range LED meters to analyze the preamp output levels, while the clip indicators supervise mic preamp peak levels. Thru-puts and word clock allow convenient syncing of the device with intricate system configurations. It is an 8 channel preamplifier that delivers outstanding performance. The phantom power is located at the front of the device that enhances its overall performance and delivers maximum convenience to the users. The knobs and control levels on each channel offer excellent superior control to the users. It is essential to make few adjustments to prevent the mic from clipping. PreSonus is a highly renowned brand for microphones and microphone preamplifiers. The DigiMax d* Eight Channel Preamp possesses 48 kHz ADAT Output. It is a feature-rich product that houses innumerable great features, like an impressive 24bit or 48K resolution. The amazing thing about this device is its eight mic preamps that are supplemented by an incredibly balanced analog output. The feature that makes it a stand-out product is that has an extensive dynamic range with an inbuilt word clock input. With a 20 dB PAD, it holds great charm and is one of the premium multichannel microphone preamps. What's the best part? :The amazing clock solution is complemented by an incredibly silent internal structure, and so you would not experience any noise while recording or performing. It is an immensely flexible device that comes with a LED input metering per channel, and hence, must be given a try. This is a spectacular preamp that possesses single dial compressors offering better control to the users. It comes with a ‘more’ switch that doubles the overall output ratio. With a perfect compression mechanism, it delivers amazing effect and depth to the final output. The eight channels are supported with 24 bits and 96 kHz that makes it an incredible preamp ideal for different sorts of mics. It is a highly-priced device that is not worth the features. The company should keep the price a little low. Also, heavy drummers must stay away from it as it might not serve them as per their expectations. It is a versatile mic preamp with inbuilt vocal processing abilities. It begins with a solid state mic preamps with switchable 80Hz high pass filter, variable gain, and phantom power. The fact that sets it apart it is highly useful compression, expander selection and denser, all of which deliver amazing flexibility that other preamps don’t possess, along with convenient yet deep regulation over the consequential sound that makes it viable for distinct vocal styles and even other musical instruments. From home recording, podcasting, to live performance, the usual consensus is that this mic preamp can perform it all, and do it well at that. Users have innumerable good things to say about DBX 286, with its sound quality being the most prominent quality. Large numbers of users have impressed with its high-value for money, making it manageable for beginners, while still possessing good features for qualified users to appreciate. There were little complaints about the lack of output options that prompted some users to transform or substitute their cables to make the device work with their ongoing gear. It is not a preamp in itself, but it employs the robust power of a preamp to enhance the sound quality of Dynamic and Ribbon mics. It is a feature-rich device that is designed particularly with active circuitry that adds +25dB of transparent gain, leading to enhanced capture of sonic details and offering greater compatibility to any ribbon mics. On the other hand, It can be used only with ribbon mics and passive dynamic mics as it is based on phantom power functionality. It is a mic boosting preamp as it greatly boosts the sound quality and volume of numerous types of mics. The resulting sound is much cleaner and great to capture the human voice, for singing, chatting, podcasting, and more. When coupled with a ribbon mic, it delivers excellent output. It is even excellent to pair with acoustic guitars and other similar instruments. In one term, it is a ‘clean’ preamp regarding its performance, functionality, output and design. It is a much high-rated product that lacks notable features with the CL-1. Unfortunately, It could be rated better if it could have work with phantom powered mics. Focusrite is a renowned device for its transparency and quality of the solid-state mic preamps. The OctoPre series give an eight of the most sought after preamps in a compact, rack-mountable form. It is inbuilt with ADAT digital output, and hence, can be employed to develop the input capacity of compatible audio interfaces, while at the same time delivering same sound quality as witnessed in Focusrite’s other preamplifiers. It possesses controls on the front panel including gain knobs and easy to use switched for the phantom pad and power. It also houses a nifty LED metering display that makes checking each channel convenient. It is an ‘excellent’ preamp that reportedly has excelled both in flexibility and sound quality, while other users have appreciated its ease of use. – That, right! A big number of users have attested to its quality, appreciating it for its satisfactory performance when performing traditional vocal recording and when supporting instruments, such as violins, guitars and drum kis. There were few complaints during the initial launch that have deteriorated over a couple of years of use. It is a fully professional tube preamp with a dual-servo gain stage that enables for augmenting the program signal to high levels without considerably enhancing the background noise. Discrete elements and high-voltage operation offer wide dynamic assortment without compromising detail. This is an amazing 2-channel preamp that is tube-driven and designed to reproduce the natural pleasure of old preamps. It uses 12AX7 tubes to ensure that the job gets done perfectly. The wider frequency response and enough gain for functioning make it an ideal choice for ribbon mics. It comes with a rack mount form factor with a conventional school looking interface completed with backlit analog VU output meters. For the cost, this unit is housed with a 60db gain knob, low-cut filters, and input impedance, all of which enable for a premium level of control and the resulting high-quality sound. Also, It supports stereo operation and dual-mono, so it could stereo tracks and recording with convenience. You would definitely love the sound quality of this preamplifier, particularly after considering its price. While it is an excellent option to bring new life to your recording, you would also appreciate its smooth and subtle edges along with well-polished results. 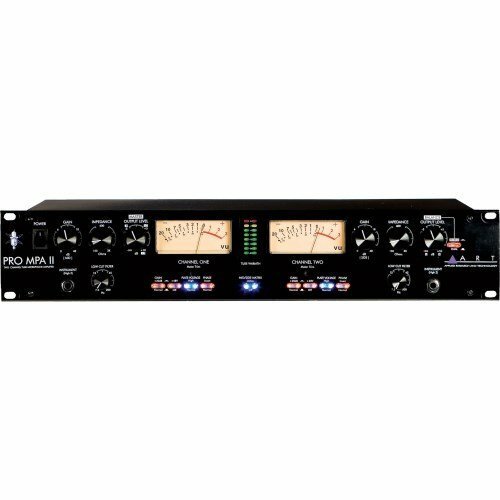 You can use this preamp win conjunction with the vocal recording or use it as a unit for recording with other instruments. The resulting coloration might dishearten your expectations, but then it is a preference and not a necessity. You might experience better results with factory installed tube. It would be wise to use it with safety as you might experience some build-quality issues. The Ultragain Pro MIC 2200 is a new addition to the mic preamp with 2 channels using a pair of 12AX7 tubes crafted to add warmth even during live performances. Manufactured by the reputed company Behringer, it comes with a plethora of features, comprising a 12db high-pass filter, phase reverse, parametric EQ, LED metering and input and output control. The device comes in 1U rack profile for convenient integration into your current rack gear. This preamp is usually a favorite among most of the users. With numerous high-quality features and a true worth for money, it ranks among the bestselling preamps. The versatility and sound quality through its EQ and high-pass filter are highly appreciated by numerous users that include guitarists, vocalists, bassists and other musicians. You must try this device but check for its power supply. The inbuilt EQ might not impress you but is still good at an affordable price. Audient is considerably a new launch in the gear market, but have started gaining much attention, particularly in the mid-tier price range. The ASP800 exhibits the power of the company, offering high-quality and advanced functionality at a reasonable price range. It is a rack mountable device with 8 channels, two of which have MOSFET and Magnetic drive controls, unique features that let you go from transparent to saturated coloration as per your preference. With amazing sound quality and versatility, it expresses satisfactory results with the transparent operation, while others offer the coloration abilities of its first two vintage style channels. Most of the reviewers executed the device for drum mics, but there were others who favored this application, including amps, guitars, and vocals. There were few imperfections regarding the device’s build quality. If you are not keen on substituting the preamp and just wish to enhance the sound quality of your ribbon and dynamic mics, then you can select any of the above preamps. While the Cloudlifter Cl-1 Mic is an excellent option to be used with long run cables, the Audient ASP800 8-Channel Mic Preamp and Focusrite OctoPre Mk are ideal multi-channel preamps that offer more functionality. Check for your requirements and select any from the top 10 best microphone preamps!